The single biggest advantage of the grow-pipe design is that they are easy to manage and construct. Each pipe in my system has 14 or 15 net-pots in it, each of which can be easily taken out to work on the plant in it. When the grow-pipe is empty, it’s relatively light, since it isn’t burdened down by a substantial mass of filter media in it, such as gravel. The single biggest problem that I can foresee with the grow-pipe design is the lack of filter media in each pipe. In other words, the lack of Biological Surface Area (BSA) compared to a standard deep-media grow-bed design. This means that the beneficial bacteria, which handle the ammonia-to-nitrate conversion process, have comparatively little space to live. The good news is that with a comparatively simple set of DYI canister filters, I’ve fixed most of that issue, as far as I can tell. My last water test, as of two days ago, shows minimal levels of ammonia (NH3), nitrite (NO2) and reasonable level of nitrate (NO3). Nitrate, of course, is plant food. The beneficial bacteria convert toxic ammonia into nitrate, which the plants remove from the water, ensuring the water is once again fish-safe. The canister filters are each a sandwich-stack affair, about 30cm / 1ft in diameters. Water pours down into the open top of them from a 25mm pipe. It first lands on a 30mm thick wad of poly-thread filter. It then flows down through this into a 30mm thick layer of “bio-balls”. Beneath this layer is a 30mm thick layer of “Hydroton” expanded clay pellets. Next is a 30mm thick layer of pea-gravel, followed by the last layer, also 30mm thick. This is 20mm – 30mm gravel; this is the only layer below water level in the sump. Each layer of the filter stack provides different amounts of water flow, air flow and BSA. This ensures that BSA is fairly high, everything stays wet, and as many different types of nitrifying bacteria can find a home as possible. It also mechanically traps any fine solids that make it through the settling tank, ensuring that they decompose aerobically. Obviously, I’m watching my water chemistry like a hawk right now, since I just put $50 worth of rainbow trout into the fish tank last week. If the ammonia numbers start to go bad, then I’ll need to substantially increase my BSA quickly. That is it for Part II of my backyard aquaponics build article. In Part III, I’ll talk about my air pump and where I’m injecting air into the system. 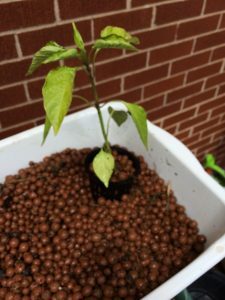 As well, I’ll talk a bit about the plants I’m putting in to grow. Thanks very much for reading. If you have any comments, questions, or suggestions, I’d love to hear from you in the comments section below. Let me know what you are doing with your own aquaponics systems. I’d love to hear from you.